In February 2018, the Cooper Hewitt Smithsonian Design Museum launched a special exhibition, entitled “Bob Greenberg Selects: Connected by Design”. 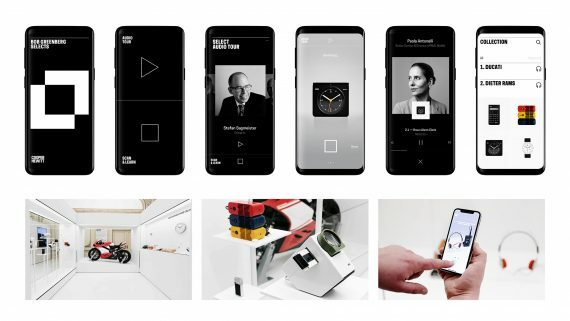 The exhibition showcased over 45 innovative works that explored creativity in the age of technology and the timeless design principals they have in common. We produced a companion mobile application with artificial intelligence (AI) for visitors to use to view the exhibition. The app allowed visitors to get more information, including expert commentary, video content, links to further information, and related contents, simply by holding their phone camera towards the object of interest. The app also detected when visitors approached the screens within the exhibition space where video content was constantly playing, and turned on the audio on their app experience at the right moment. This was achieved by embedding a new ultrasonic data delivery technology into the application. Each screen within the space broadcasted a particular signal that the app would detect, directing it to deliver the audio. The exhibition itself created a very personal moment for visitors viewing the objects within the museum. And using emerging technologies, the app added a seamless quality to the experience, that felt almost magical. The interface was so simple and intuitive, visitors of all ages found themselves simply following their curiosity, delving much deeper into the context and history of each object than they would in a more traditional setting, where content isn’t as effortlessly digested. This app represents a ground-breaking approach to the museum experience, where digital content was delivered in a physical space using artificial intelligence. And this simply translates to a more immersive, free-flowing and enjoyable experience for visitors exploring the exhibition.